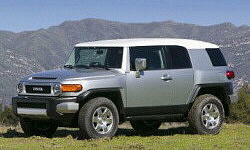 Why the 2007 Toyota FJ Cruiser? Again, all rubber floors make clean up a breeze. Unique interior design is eye appealing to some. Ergonomics could be better, speedo/gauges hard to read when wheel is set to comfortable position. Engine sounds great and feels bigger than it is! Handles well for an SUV with a high center of gravity, but strong winds will have you wandering around your lane. 4 wheel drive wroks great, as is to be expected from its heritage. 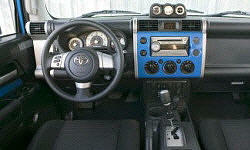 Why Not the 2007 Toyota FJ Cruiser? Having owned one, and lusting after it when first introduced, I came away disappointed. Windshield cracks right away from flat profile & anything thrown up from the road. Comfort is lacking & road noise/wind is readily evident. Value over duration sucked. Rear suicide doors are cool - unless you have to use them. Easier than no door, but hard to access for adults or kid seats. Really a 2 person back seat, 3 is not good. Rear seat visibility is poor, front view blocked and side posts take out side view.